Tarte Au Citron (Lemon Tart). I find this tart a little on the sweet side. I have a recipe for a similar lemon curd but it has less sugar and more eggs. It's my first time handling the torch (for torching the meringue). I love the smell of burnt sugar. This Tarte Aux Noix (Nut Tart) might be my favorite tart yet. It's like a cake within a tart shell. The filling is made of almond flour and hazelnut flour held together with french meringue. It's surprisingly light on the inside. ﻿Today is the most stressful day in the kitchen since the start of the program. It does not help that my partner and I are both assigned bakers as well. Assigned bakers are responsible for baking all the goodies (for half the class) so that all the tarts are loaded in the oven at once. What a crazy day! I love how these ganache tarts turned out. Picked up a couple of new skills today despite all that craziness. I am happy about that. This Chocolate Bavarian Tart is delicious. It has some gelatin in the filling which gives the dessert a great mouth-feel. We mixed in the left over candied lemon from yesterday's lemon tart into these cookies. It's wonderful... besides, I love being able "repurpose" my ingredients/leftovers. One advantage of being a neighbor, in addition to the samplings, is the added bonus of brushing up on my french. 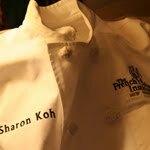 After the 6 months of pastry school for Sharon, I hope to be able to expertly order in a patisserie in Paris.